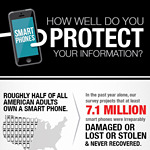 In the past year 7.1 million smartphones were irrecoverably damaged, lost, or stolen. Based on the findings of a Consumer Reports survey – which will be highlighted in their June 2013 issue –39 percent of 1,656 adult smartphone users polled neglected to take minimal steps to protect their data – many failing to implement simple password protection on their devices. This inaction, emphasized in the consumer sampling, denotes that millions are at risk – as half of all American adults own a smartphone – for being physically hacked for personal information. People frequently use their smartphones to access social media and bank accounts, buy coffee, track investments, and board planes with a digital ticket. A lost phone could mean complete admittance to sensitive and pertinent data. Yet people are more vigilant to protect their home PCs and other computer-like devices in comparison. The survey also addressed malicious software, stating how it can be easily downloaded through infected apps – effecting five to six million phones a year. Although not as commonplace as personal computer infection, the problem is growing, and many of the apps ask for more information – like tracking – than they should. Children and teenagers are also prone to unwittingly disclosing personal information, according to the study. Of those surveyed, only 31 percent regularly backed up data – which means 69 percent of people on average fail to. That means those videos, photos, contacts and other files can be gone for good with one clumsy bathroom faux pas or pickpocket. There are several programs available, some offered through cellphone providers that will regularly backup data. Another 64 percent stated they didn’t use a screen lock – as 23 percent use a four-digit pin while 13 percent use a swipe pattern. Additional stats revealed only 15 percent use antivirus apps which block infected programs from hacking; 22 percent use phone locators to isolate lost or stolen devices; and only 8 percent use remote wipes which can expunge the contents of the phone in the event they end up in the wrong hands. Please click on Consumer Reports Infographic below to see overall statistics.